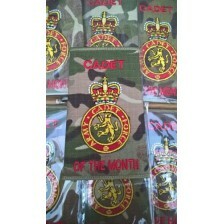 New style Army Cadet Force rank slides as per the new Army Dress Regulations Part 8 for badges of ra.. The approved smaller sized ACF training award badges to be worn on the new Personal Clothing System ..
Regulation ACF TRF for Army Cadet force Adult Volunteers Sold individually. ..
Regulation Cadet Instructors Cadre course embroidered badge. The Junior Cadet Instructor Cad..
High quality regulation embroidered badge awarded on completion of the Radio User course Whi..
ACF and CCF Skill at Arms Weapons Flashes. To be worn with the appropriate shooting proficiency awar..
TRF for Army Cadet force Adult Volunteers 55mm by 35mm Sold individually. .. Bronze Award Complete all 4 sections with a further 3 months in either the Volunteering, Physical o.. The badge is worn with the appropriate flash designating the weapon at which the standard has been a..
Cadets are taught First Aid to recognised standards and are awarded relevant certificates, as part o.. Ideal Opportunity to promote the good work of young people within the Detachment. Made from MTP M..